Imagine coming home and finding your house empty, Alec your husband gone, Emma and Fleur your children gone, their clothes gone, the servants disappeared, the phone cut off and no note. No explanation. No reason. For Lydia Cartwright this is what she returns to. But this is not a novel set in modern times. It is 1955. Lydia Cartwright is in Malaya. What has been called the Malayan Emergency is at its height of conflict. The only person that can help Lydia says that her husband as had to go further up the country with the children and she is to follow. With no answers to the hundreds of questions she has only one choice to make. Go further up-country and join her family. I knew nothing of this civil war, but I learnt a lot by reading as Lydia fights her way through the jungle to try and reach her family. Little does she know that her family are never going to be at the end of her journey. As readers we know exactly where her children and husband are. We are transported back to Britain in the mid fifties. The Second World War is still very much a vivid memory, the country is trying to get back on its feet. The colour, heat and smells of Malaya are a far contrast to those of a wet Worcestershire. As time passes, Lydia starts to give up all hope of finding answers. Whilst her daughter gives up asking questions about her mother. The future is going to be very different for them all. Something is not right though, there are secrets, lies and deceptions with every person met and every corner turned. Surely those once separated can at least be joined again in some way across two continents. 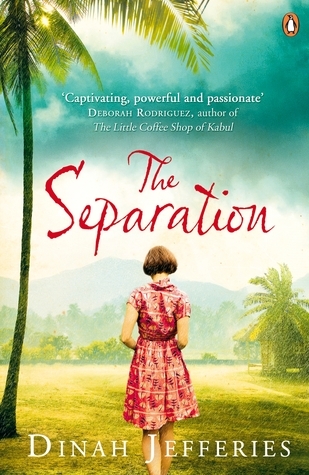 This is a very powerful moving book, not just dealing with the separation of mother and children but also the issues of being in a country which is in the midst of civil war. Nothing is glossed over, this book has clearly been researched and although it does not deal with actual events it gives a clear view of what was going on and without any bias towards the British Colonial administration. That made a refreshing change. As we follow Lydia on her journey, we learn more about her past and her life in Malaya. It seems that perhaps we are not to feel sorry for her because of her actions. I doubted her actions and the reasons, but as I learnt more I began to appreciate really what she had been through. In contrast as the book moves across oceans back to England and Lydia’s daughters we learn what they are being told and what they need to believe, to survive. This part is a very personal account as if Emma is talking to the reader directly as opposed to the narrative of Lydia’s story. This book encompasses so much and was a clichéd page turner for the simple reason you had to find out what happens as I cared about the characters. An excellent début novel and I am looking forward to reading The Tea Planter’s Wife kindly provided by netgalley and the publisher Penguin.